Superior performance for home, studio or stage! 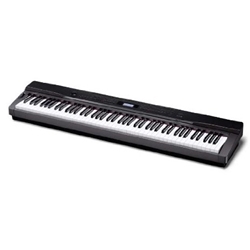 The new Casio Privia PX-330 redefines the digital piano category with unprecedented sound quality and performance in a sleek package that is supremely portable. Featuring all new grand piano samples and a new Tri-Sensor 88-note scaled hammer action keyboard and weighing only 26 lbs., the Casio Privia Keyboard PX-330 is versatile enough for any home, studio or stage.